From the British Medical Journal dated Oct 1970. 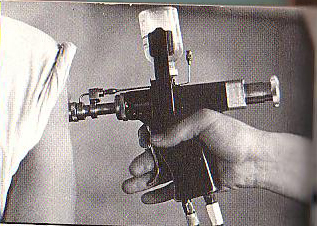 "Though smallpox vaccination by jet injection is accepted in the U.S.A." it is rarely carried out in Britain, partly because of problems associated with the dilution of vaccine LYMPH to volumes which can be used by jet injectors, and partly because LYMPH is NOT necessarily bacteriologically sterile and has, therefore, been regarded as unsuitable for intradermal inoculation." 1948 Inoculation Hepatitis Study Experience has shown that it is very difficult to achieve a fully reliable sterilization of blood guns. Washing with ether, alcohol, or other disinfectants is not sufficient." 1970 Jetgun Warning & Vaccines Though smallpox vaccination by jet injection is accepted in the U.S.A." it is rarely carried out in Britain, partly because of problems associated with the dilution of vaccine LYMPH to volumes...used by jet injectors, and partly because LYMPH is NOT necessarily bacteriologically sterile...regarded as unsuitable for intradermal inoculation." Lymph is the same thing as blood plasma....and plasma contains a protein called ALBUMIN. So if plasma is not sterile then neither is albumiin. 1977 Warning Furthermore, the efficacy of the ISG, manufactured in 1944, against apparent type non-A, non-B hepatitis suggests that this overlooked disease has existed from at least that time. 1982 Plasma derivatives & viral hep low-risk irrespective of the plasma from which they are manufactured because they are heated at 60 degrees C for 10 hours (Albumin, Plasma Protein Fraction) or because they contain protective antibodies (Immune Globulin). 1986 ISG Formula- 3 Generations More than half of the commercial intramuscular immune globulin lots, including specific immune globulin. All immune globulin products examined were reactive for anti-HCVproducts, were HCV RNA positive. All immune globulin products examined were reactive for anti-HCV. 1994 Detection HCV RNA in immune globulins More than half of the commercial intramuscular immune globulin lots, including specific immune globulin. All immune globulin products examined were reactive for anti-HCVproducts, were HCV RNA positive. All immune globulin products examined were reactive for anti-HCV. 1996 Cardiac Surgeon Risk Transmission of Hepatitis C Virus by a Cardiac Surgeon...evidence that a cardiac surgeon with chronic hepatitis C may have transmitted HCV to five of his patients during open-heart surgery. 1996 Cardiac Surgeon Transmisson Hepatitis C may be transmitted during surgery- An infected cardiac surgeon transmitted the virus to five patients during open heart surgery. 1998-Jetgun Contamination This study demonstrated that needleless injectors become contaminated during in vitro use and direct contact with contaminated surfaces and that needleless injectors carry over the contamination to subsequent sites of release. 1999 Safety and availability of immunoglobulin replacement therapy in relation to potentially transmissable agents- Cohn–Oncley fractionation is not sufficient to remove lipid-coated viruses, additional antiviral inactivation steps are required. 1999 Risk of cross-patient infection use of a needleless injector device. Postejection reverse flow drew contaminants into the device, and increased with ejection volume. 2000 Origins of HCV Epidemic "Why does the world's medical community continue to ignore these figures...stop the practice of allowing multi-use syringes... world over. mandatory in all mass vaccination programs...contribute significantly to the scourge of disease..."
2003 Risk of EMG Needles “Platinum single fiber electrodes ... including the use of disposable NCS electrodes, .. with patients.. with agents ...Hepatitis C virus, Creutzfeldt-Jakob disease, and human immunodeficiency virus”. 2004 Transfusions- Fatal Bacterial Infections Health-care providers should be aware of the new standard and the need for bacterial testing of platelets to improve transfusion safety. 2008 CDC- Jetguns (PCNIF) Fail Safety Test The study ended early because the PCNFI failed to prevent contamination in the first batch tested (8.2% failure rate)..
2008 HCV via contaminated Surfaces Nosocomial" transmission in healthcare settings is the second most common route of hepatitis C virus (HCV) transmission, after shared use of needles and other injection equipment. 2010 HCV screening strategies HCV testing was performed in 3803. Of these, 11.5% were positive, prevalence of HCV infection of 7.7%, 5 times higher than the estimated...40% of HCV-positive persons were unaware of their status. AASLD Hepatitis C not an STD Study-HCV disease proves not to be an STD... The disease transmits by blood to blood transmission. Science has proved again, this virus does not transmit unless blood by both people is exchanged. Clinical management of drug–drug interactions his overview illustrates that drug–drug interactions are an important and potentially frequent problem when using DAAs in clinical practice. It also shows, however, that many of the interactions are manageable by either dose adjustments or selecting a safe alternative, but only if one has sufficient knowledge and expertise to deal with these pharmacokinetic issues. Dental treatmen was commonest conventional risk factor Dental treatment: 278 (32.55%)...Non-conventional transmission of hepatitis C: a true possibility ignored... show very high risk for HCV transmission by dental procedures. Federal response to Veterans with Hepatitis C "You've got a demon on your hands," he said. "You'd better find out where that's coming from if you can." HCV & Depression Meta-Analysis One in 4 chronic hepatitis C patients who start interferon and ribavirin treatment will develop an induced major depressive episode. HCV Disease Dermatological side effects Dermatological adverse events (AEs) are an existing concern during hepatitis C virus (HCV) infection and peginterferon/ribavirin treatment. HCV infection leads to dermatological and muco-cutaneous manifestations including small-vessel vasculitis as part of the mixed cryoglobulinemic syndrome. Hearing loss related to treatment Sudden hearing loss associated with interferon. High Comorbidity Burden of the U.S. Hepatitis C Virus-Infected Population The researchers concluded that this U.S. medically insured HCV population is highly comorbid. Effective strategies to manage these comorbidities are necessary to allow wider access to HCV treatment and reduce the future burden of HCV disease and its manifestations. Thermal stability and inactivation of hepatitis C The results provide quantitative evidence for the potential use of a variety of approaches for inactivating HCV. The ability of HCVcc to survive ambient temperatures warrants precautions in handling and disposing of objects and materials that may have been contaminated with HCV. VA HCV Prevalence VS Therapy The prevalence of hepatitis C virus (HCV) infection among VA patients is 3x higher than in the general population. Recent VA data indicate that only about 14% of all HCV-infected VA patients have ever received antiviral therapy. Interferon: A Historical Perspective Unfortunately, the prolonged peginterferon therapy necessary to control chronic HCV or HBV infections was often associated with serious side effects such as fatigue, fever, and myalgias, symptoms of many acute virus infections, possibly because such effects are due to the induction of IFNs by the infecting agents. Prevalence of Hepatitis C ...resulted in a policy of immune globulin use for all deployed soldiers. By 1970, rates were one-half to one-third of the earlier rates... Hepatitis B immune globulin is listed as a Red Cross Risk Factor for transmission of Hepatitis C.
So it's important a copy is obtained from your local library and stamped as such to verify it's origin. References are provided for each source to obtain the copy.